Cable extension Extension up to total 10 m 32.808 ft is possible, for both emitter and receiver, with 0.18 mm2, or more, cable. Weight Emitter: 70 g approx., Receiver: 70 g approx. 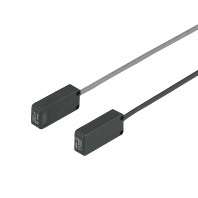 and receiver, Target label: 2 pcs.